14 September 2016 - Mackie announces a new series of studio monitors - XR Series studio monitors. Aimed at professional and project studios, XR Series offers two models, the 8-inch XR824 and 6.5-inch XR624. With XR, Mackie delivers an accurate studio monitor design that offers the clarity, performance and modern look to meet the needs of the modern studio. 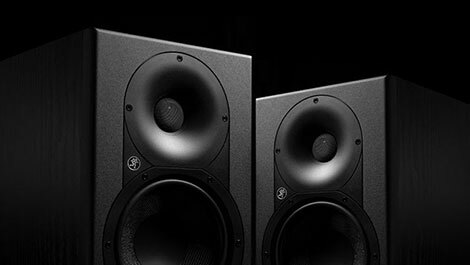 Drawing inspiration from the performance and aesthetic aspects of the proven Mackie HR Series monitors, XR features a smart logarithmic waveguide, providing acoustic alignment to deliver precision balance between articulate highs and midrange clarity. Both models feature a 160W power amplifier and premium transducers including a Kevlar LF driver with proven fast-recovery from transients, virtually eliminating resonant frequencies. And, unique to XR, Mackie has developed the new ELP Bass Reflex System which utilizes an extended-length, internally curved port that delivers bass response and increased output capability. XR Series studio monitors can be sonically optimized to the specific mix environment, featuring user-controllable acoustic space tuning controls. There are three different acoustic space settings that adjust for monitor placements close to walls, in corners, etc. Plus, both high- and low-frequency EQ controls are available for final sonic adjustment to the mixing space. Other finishing features include an eco-friendly auto on/off functionality that senses when a signal is present and turns that monitor on or off, plus the inclusion of acoustic isolation pads for each monitor. The Mackie XR Series includes the 8-inch XR824 and 6.5-inch XR624, both with worldwide availability beginning November 1, 2016.